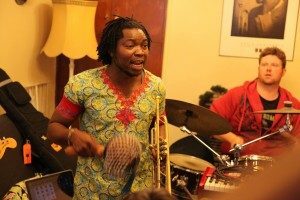 Composer, singer and trumpeter Olugbade Okunade joins us on the Pan African Space Station LIVE from MUMA in Melbourne for a live performance featuring Enoch Ogiemwanre on Thursday 11 April from 17:30 -18:00 (AEST). Part of Fela Anikulapo Kuti’s Egypt 80 (led by Seun Kuti) for 14 years, Olugbade Okunade, now based in Melbourne, is passionate about staying true to the form of Nigerian Afrobeat. His band, Alárìíyá presents a unique style that draws on funk, juju, highlife and afrobeat and is fast becoming a well known name in Melbourne’s music scene. Tune into PASS and follow us on Twitter/Facebook/Instagram for more. Category: Pass Blog | Tags: Olugbade Okunade, PASS Melbourne | Bookmark: permalink.